THE ICCA CONGRESS: A MUST FOR MEETING INDUSTRY PROFESSIONALS! Prague CVB anticipating an all-time record attendance of well over 1,000, with an especially strong showing from our European members, who make up over 50% of the total ICCA membership.They are committed to line up the largest and strongest ever group of expert speakers from outside the meetings industry, who will be drawn from all regions of the world.We promise to deliver a record attendance by hosted international association executives, both on stage and as delegates. The world-class education programme will be custom-designed from scratch, and will help shape the future direction of international association meetings. 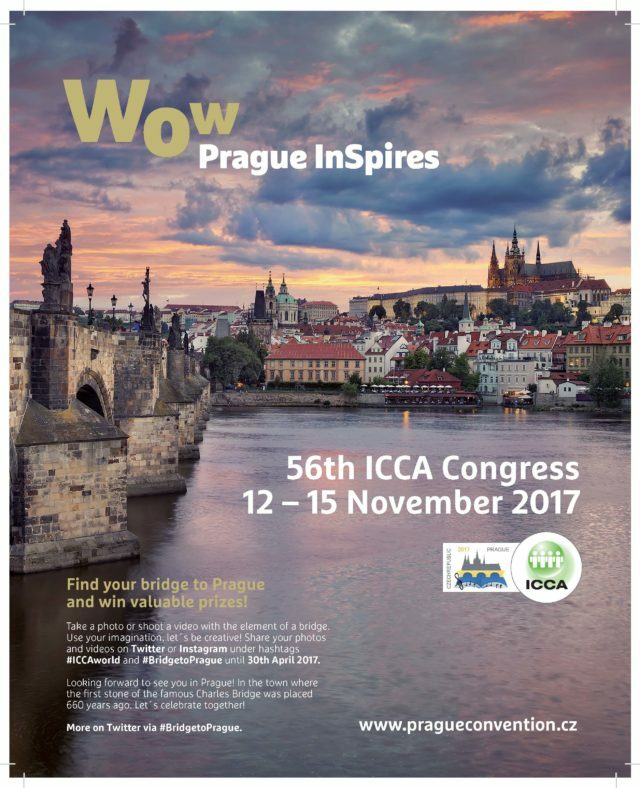 Prepare yourself for the 56th ICCA Congress in Prague! Brush up on your knowledge about Prague’s historical bridges and learn more about the #BridgetoPrague competition – the way to win several prizes which are up for grabs! For more info click here. Next articleStep into the marketing jungle at Conventa Crossover 2017!